Stretch the bacon using a large knife then cut the slice in half about 10cm x 3cm lengths. 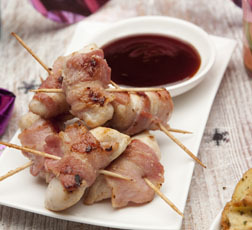 Wrap a piece of bacon around a cube of chicken and thread onto a cocktail stick. Repeat with the remaining bacon and chicken. Heat a frying pan until hot and add the chicken and bacon skewers, brown on both sides for 2 minutes, then remove and place on a lined baking tray. Cook under the hot grill for a further 8 minutes or until cooked through. Meanwhile, mix together the marinade ingredients and serve immediately. To freeze ahead: Complete the recipe up to the end of step 2. Lay on a flat tray and freeze until solid, then gather them up and package in airtight container and return to the freezer for up to 3 months.To use: The skewers can be cooked from frozen. Complete the recipe and allow 5 minutes longer cooking in the oven.Top tip: If you want to push the boat out cubes of beef filet would be good too wrapped in bacon, as would roasted new potatoes, and for anyone who loves seafood, scallops and prawns work well too.